A three-day reenactment of a traditional New Year Ceremony in the Ryukyu Kingdom era, when kings ruled and the royal family and court were filled with splendor, takes place January 1st through 3rd at Shuri Castle Park. 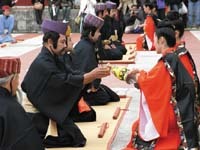 Known as the ‘Morning Prayer Official King’s Ceremony’, the three-part ceremony offers a glimpse into royal life that commoners of the time never had a chance to see. In between the ceremonial elements, there’s plenty of time to take in the once-in-a-lifetime sights of Shuri Castle. The first segment at 11 a.m. each day is a ceremony for the king to offer prayers to God. The king, queen, family, attendants and VIP’s were invited, concluding with a banquet. 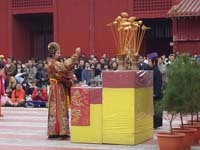 The second segment, staged each day at 2 p.m., takes visitors further into court life, as local VIP’s were invited to pray for the king’s health, prosperity and longevity. The third element of the traditional ceremony, conducted each day at 4 p.m., recalls the time when invitees had an opportunity to offer toasts to the king and wish the royal family a happy new year.